Without a clear focus, its too easy to buckle under to distractions. Set targets for every day beforehand. Decide what youll do; then do it. We often discuss our goals as if theyre nothing but dreams. Actually, we can accomplish goals on a daily basis. Daily goals contribute to weekly goals. Weekly goals add to monthly goals. Monthly goals add to--you guessed it--yearly goals. However a lot of people have no idea how to set goals or what other steps need to be taken for increasing productivity. You know why most people have a tendency to not achieve the success they desire in their business and overall life? Its because they dont know about Heuristics. Heuristics are conventions specified to help you solve problems. When a issue is large or complex, and the optimal solution is unclear, employing a heuristic lets you start making progress towards a resolution even though you cant envision the entire path from your beginning point. You Can Have Better Success In Business And Life If You Discover 20 Productivity Boosting Methods For The Positive Mind! * They dont know how to set goals. * They are struggling with the idea of micro-mileposts. * They also dont understand time framing! With the strategies that Im about to let you in on , you will have no problems when it comes to learning how to increase your effectiveness and save hours everyday! 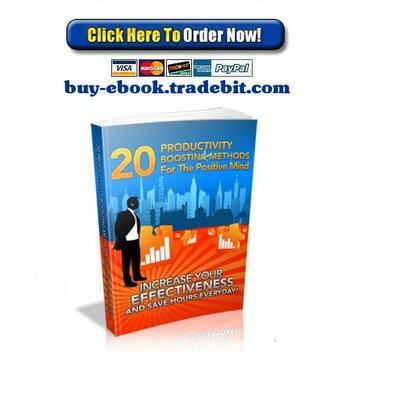 Make Full Use Of This Knowledge And Get A Real Look At 20 Productivity Boosting Methods For The Positive Mind! Lets face it - Individuals can get engrossed in the details of their lives and chase the next big thing without finding time to complete the projects they previously started. When faced with all of their incomplete projects, they often become deluged and start to procrastinate. Youll find that their productivity decreases and they dont produce the results or environment youre used to seeing. What are the things on your list of things that need to get done? Grab Your Copy For Only $1.99!